Written for the special forces in Vietnam. 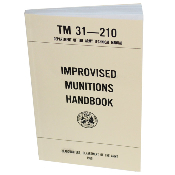 Covers the manufacture of explosives and propellants, mines, grenades, small arms weapons and ammunition, also mortars, rockets, incendiary devise fuses, detonators and much more. This is the how to book that all the others copy.